Heading up to Charlotte this coming week for the Crossroads Classic, and this time I’ll be exploring the area northwest of Charlotte with Kristine and the kids … should be fun! This entry was posted in Racing on July 31, 2011 by kartoone. HOT! Those three letters describe my day yesterday with the air conditioning in my car broken. Here are three temperature graphs from the day. 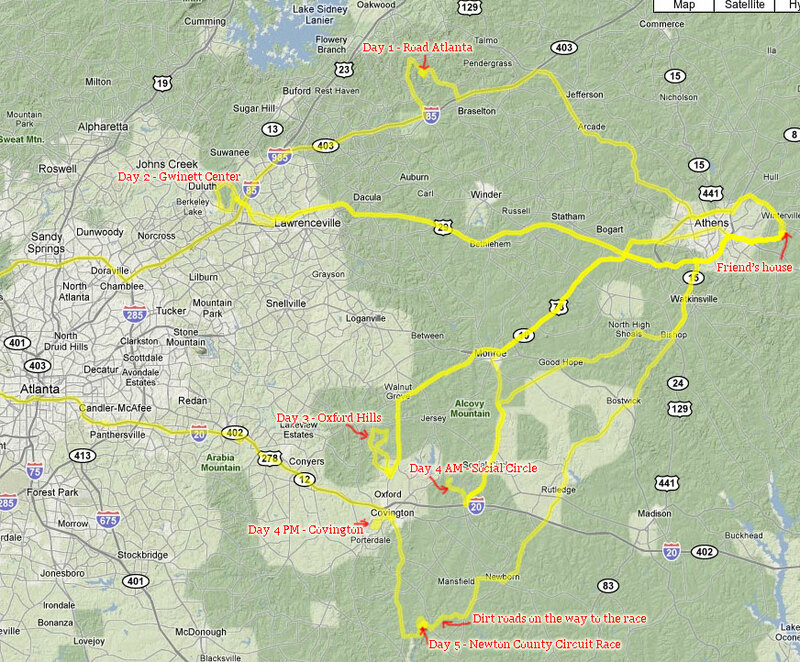 Drive from Winterville, GA to Newton County outside of Covington, GA! 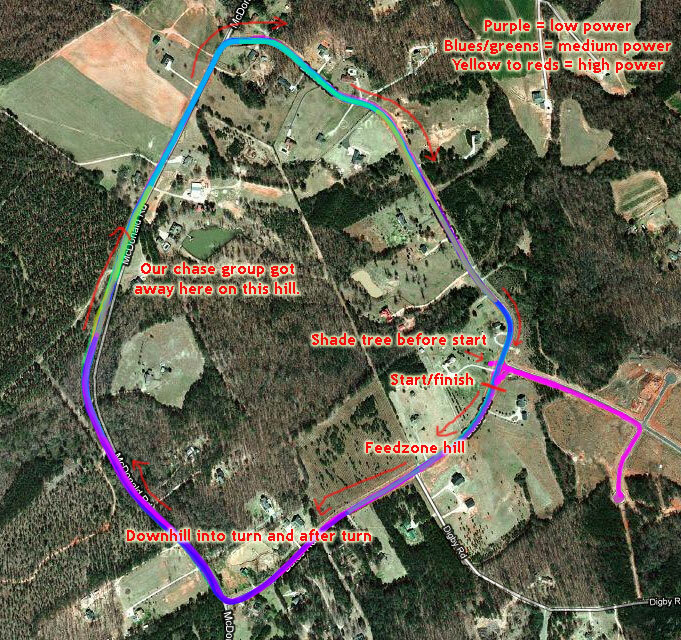 The Newton County circuit race – the race had some good shade on half the course. Our race was again combined with the cat 3 race making for a total of 79 riders in the field. My right leg was still tight/sore from cramping hard at the end of the crit on Saturday, so I decided that I would race this race pretty conservatively for at least the first part of the race. I also guessed that with a large field on a rolling course, it would be unlikely for an early move to stay away. I was halfway correct on this because all of the moves (and there were a bunch of them) in the first few laps came back to the group. Then somewhere around the fifth of twenty-five 1.8 mile laps, a good group got away with John Stowe, Alexey Schmidt (Team Type I), Sabastian Cancio (Aerocat), and a couple other riders. They quickly got a big gap as our pace plummeted in the field. At one point, I was thinking that the break might actually lap us. There was usually one attack on every lap, though, that ramped our pace way up for half a lap before slowing down again. Gavin Landsden (BBC), Jan Kolar (BBC), and me put in a one-two-three attack on one lap that I thought for sure would have gotten something away – but my attack was swallowed by the field on the descent. I drifted back to the back 1/3rd of the group on the next lap to recover. During the next couple laps, a strong group of riders including TT1, Aerocat, Oneal Samuels, and maybe one or two other riders got away from the field. After about two more laps and our pace had been really high for a long time, I decided that it was probably a good time to get a chase group going with the field probably tired from the conditions and speed. So coming through the start/finish line, I moved up sheltered from the wind to the left of about 30-40 riders strung out single file and then immediately onto the back of an attack with a few riders maybe six or seven? As the field started to catch us after the course’s long downhill, there was another attack on the gradual hill. This is the spot on the course where the field had been slowing down quite a bit, so when that attack went I knew that it had a good chance of sticking. I went with it and worked with about five or six riders to get a gap. We worked really well together as the third group on the road and were able to pull back the second group on the road after a few laps with only the lead break ahead of us with more than a minute’s advantage. Once the two chase groups merged, I could start to feel my leg giving me problems and knew that my best bet at not getting dropped is if there were no attacks. So rather than sitting on the back, I tried to work hard mashing a big gear when possible to reduce the total number of pedal strokes that my leg had to make. Even though we had a few people who weren’t working in the chase, there was enough people working that we didn’t have any attacks from our chase group until maybe 4 laps to go. From this point to the end, I stopped working to try to save my leg to be able to go with any attacks and try to get a decent finish. Dan Holt and Joey Rosskopf were drilling it at the front of our chase bringing us up to a shattered lead group of about 3 or 4 riders with two riders from the original break (Alexey Schmidt and Sabastian Cancio) still off the front with a 25 second advantage with one lap to go. This worked well for me because the TT1 duo kept the pace high enough that nobody was going to attack and I didn’t have to worry about any sudden accelerations until the sprint at the very end of the race. Even then, I was in great position for the sprint, but decided just to ride wheels to avoid any further damage to my leg. When I was ready to pass a couple people before the line, I got blocked in by one rider on either side who must have had the same idea about 1/2 of a second before me so I lost a couple spots. You can see how the race played out in the Strava segment data below. I think Lap 7 may have been the lap that had the 1-2-3 attack from Alabama. Lap 10 is probably where I thought to myself that if we kept that pace up, we were probably going to get lapped. Then look at how the speed ramps up over Laps 11, 12, 13. Then Lap 14 is where the third chase group was formed. Lap 19 is probably where we merged with the second group on the road. Then you can see the high speed / low watts for the last couple laps where TT1 was pulling hard to bring us up to the lead group. Here is the link for all of the interactive Strava data – http://app.strava.com/rides/1003919. You can also see how the race played out in the Strava performance graph below which shows heartrate and power. You can see how much smoother the power output is once we made into the chase group. David Gearhart won the field sprint for 19th with my teammate Justin Bynum a few places behind him to take 1st in the cat 3s to bring home the overall omnium win! I ended up 6th in the omnium. Great racing, great training – next up is the Crossroads Classic August 3rd-7th in North Carolina. Also, I almost forgot that not only did my AC stop working on the way to the race, my GPS took me on three different dirt roads to get there. 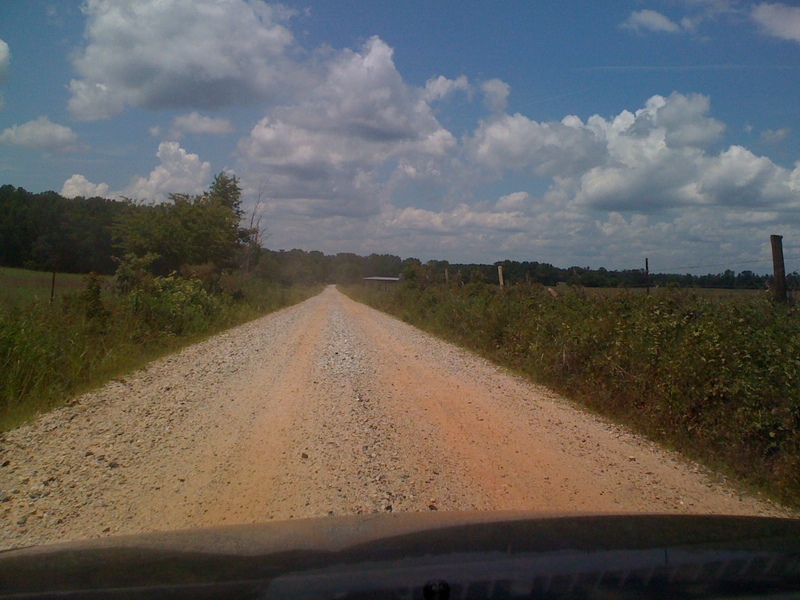 At one point, I was convinced the dirt road was about to turn into a 4 wheel drive only road as it turned to what I would call a car’s version of double track … took a couple pics to document the experience but was pretty panicky by the time I hit the double track that I was going to miss the race. I had stayed to watch the end of the Tour de France and only left myself less than 2 hours to get to the race. I arrived at the race at 1:40 for a 2:00PM start, but fortunately they were running a little late. I think we started at about 2:15 or 2:20. 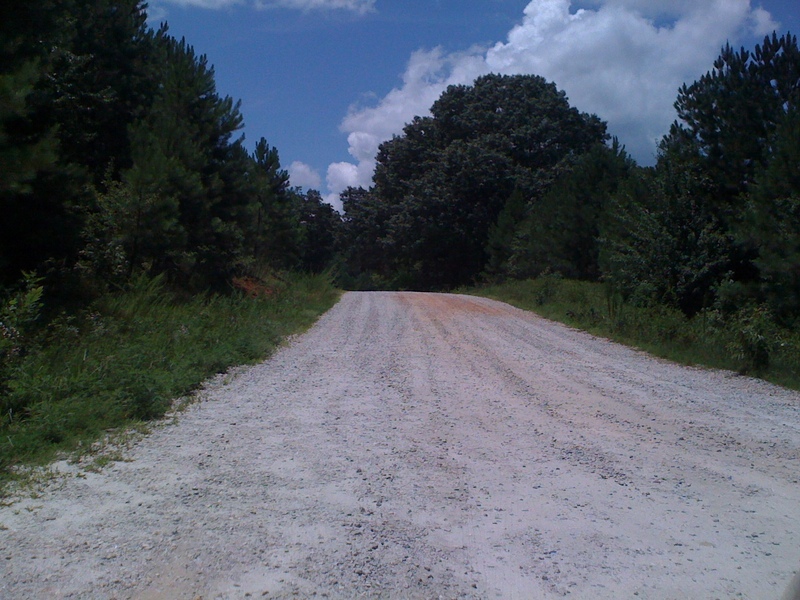 Gravel/dirt double track – beautiful country! This entry was posted in Racing and tagged circuit race, omnium, power on July 25, 2011 by kartoone.